This is part one of a two part post. Read the second part here. 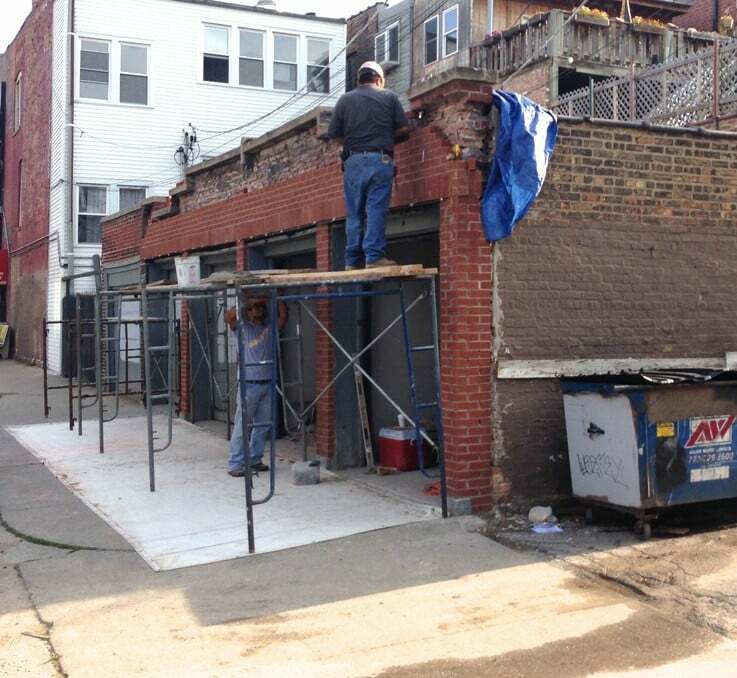 The men are very excited to return to Carpentersville to work on another magnificently constructed 19th-century masonry building (this time a former dairy). At the time this photo was snapped, the owner's demolition crew had already removed the flooring, the mechanicals, the roof and the old-growth roof joists. The 16"-thick masonry walls were constructed almost entirely with Milwaukee Cream common bricks, which were quite prevalent in this region at the time this 125-year-old structure went up. To provide a sense of sense of scale, the men have positioned themselves along the perimeter of the space. Check back over the next few weeks to see more photos documenting the transformation of this former dairy. Read more about this project, and see "before and after" shots in the second part of this post. This is the second in an ongoing series of safety-related posts. See entries Part 1 and Part 3. 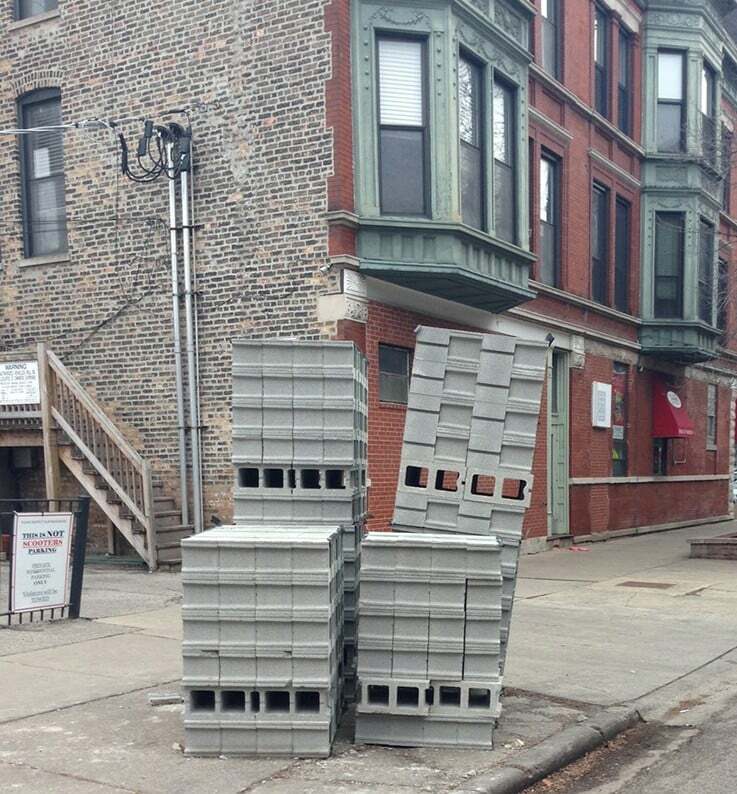 I was driving through Chicago's Lakeview neighborhood and saw how a mason contractor had "staged" these concrete blocks. When you figure that each of these concrete blocks weighs about 25 pounds when wet (it had rained the night before and these blocks were very saturated), this tippy tower weighs over 3500 pounds, certainly enough to break a bone or worse. The increase in time required to properly stage materials is negligible if you have the right training and know what you are doing. If you see dangerous and hazardous condition like this, call 311 right away and report it. This is the first in an ongoing series of safety-related posts. See later entries Part 2 and Part 3. 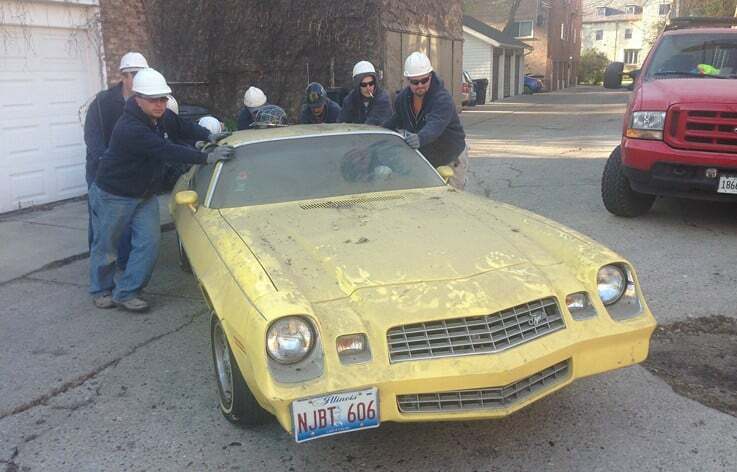 I was recently driving up Damen Avenue on the north side of Chicago. A group of masons I did not recognize were working on restoring this garage parapet wall. What I saw concerned me greatly, so I pulled over and snapped this photo. The metal legs of the pipe scaffolding are sitting directly on the concrete driveway apron. Because the mason did not use base plates and mud sills to level the set-up, the pipe scaffolding is pitching away from the building at the same angle as the concrete driveway apron upon which it is standing. This increases the likelihood of the scaffolding tipping over and the mason getting injured. No back rails have been installed to prevent the mason from accidentally stepping or falling off the scaffolding! Because falls of 6 vertical feet or greater are considered potentially lethal by the Occupational Safety & Health Administration (OSHA), any person standing on this type of pipe scaffolding needs to wear a safety harness and be tied off if no back rails are installed (there are no back rails on this scaffolding and the mason is not wearing a harness). The mason has elected to strip just the outside layer (i.e., wythe) of brick from this parapet wall and leave the back-up brick wall untouched — even above the roofline. The process of removing the outside face brick requires pounding and vibrating the entire parapet wall, and this action loosens up all the bricks…even the ones the mason is not planning to replace. The compromised mortar bond resulting from all that pounding leads to premature deterioration of the back-up wall he is not rebuilding! 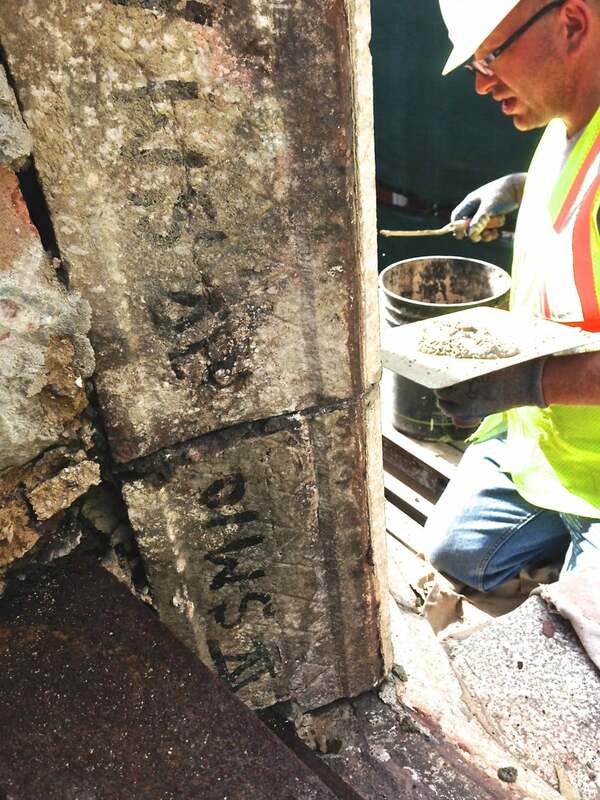 The mason has chosen not to remove the capstones and install a through-wall flashing detail. This leaves the wall susceptible to water infiltration between the capstones (where stone touches stone) and under the stone (where stone touches the first course of brick). Any time a mason is rebuilding any number of wythes of a parapet wall, it is always prudent to remove the capstones, provide through-wall flashing and stainless steel drip edges, and re-set the capstones. In the photo at rightabove, Adam is about to start tuckpointing a portion of the 100-year-old terra cotta parapet wall. As you look at the edge of this parapet wall, you can see how each piece of terra cotta was hand-numbered by the original terra cotta fabricator a century ago. The edges of the terra cotta pieces will be covered up with closely matching wire-cut face bricks and tinted mortar as the rebuilding continues. Perhaps AAA-1 Masonry & Tuckpointing will have the opportunity to rebuild this parapet wall in another 100 years? Whether your masonry structure is a century-old brick and terra cotta building like this one or a single-family home constructed in the last 20 years, we have the experience to diagnose and address your masonry issues. We look forward to working with you!